Earlier this evening, an update to the Public Roadmap was accidentally published that included changes to the content for 3.3 and beyond. In an effort to be as transparent as possible, the Roadmap feeds directly from our internal project management software Jira. This publish wasn’t intentional as we’re still evaluating features for our next releases, so none of the cards or their position on the Roadmap were final. 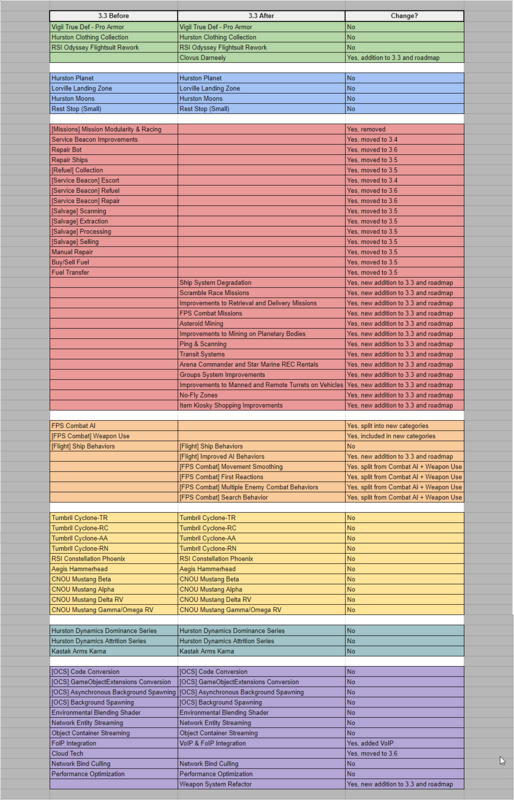 We will update the public Roadmap with this data once decided, so be aware that what you see now is not set in stone. We know many of you are already discussing the changes that are now visible. More information on the Roadmap is coming soon. We see this as an opportunity to get an inside look on the thought processes currently ongoing at CIG. This roadmap may change significantly again as it was work-in-progress when it was published. 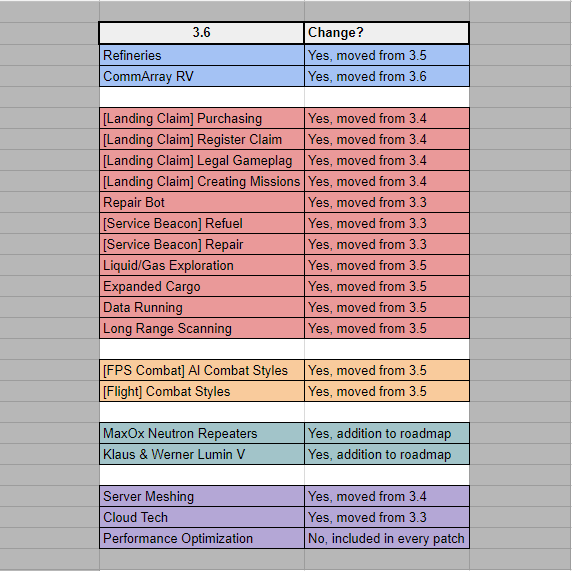 That said, CIG did not change the roadmap again on Friday when they normally would publish, so perhaps it's more accurate than initially expected. Let's dive into what this looks like. This is a HUGE change. ALL gameplay entries for 3.3 have been moved out to other patches or, in the case of Mission Modularity & Racing, simply removed (I think this will find its way back mixed in with other entries). 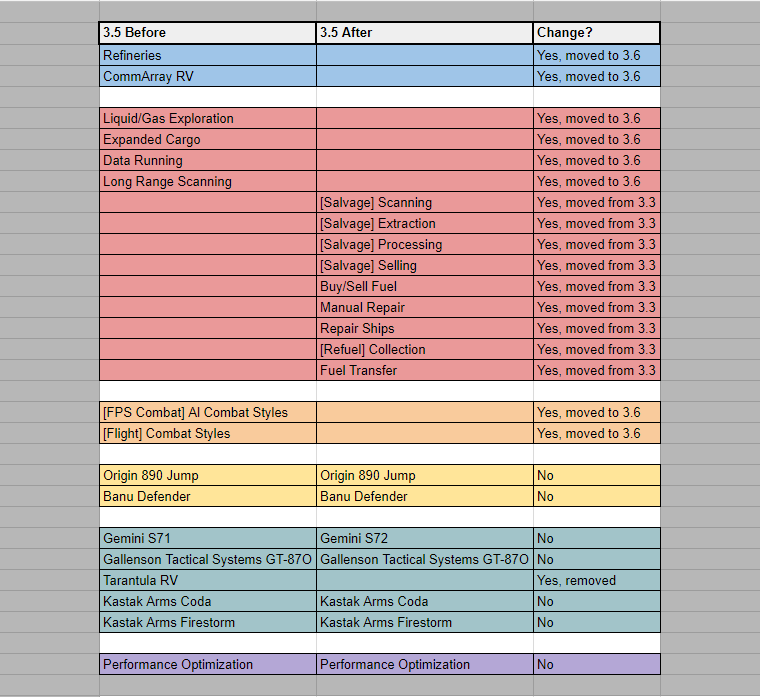 Instead of focusing the gameplay features for 3.3 on Salvage, Repair, and Refueling, they have instead chosen to strengthen many existing gameplay elements such as missions, scanning, mining (addition of asteroid mining and improvements to planetary mining), and to introduce the FPS aspects. You can see FPS being introduced with FPS Missions, No-Fly Zones (requiring on-foot or ground vehicle transport), and the expansion of the AI section to include specific FPS AI behaviours. Additionally, on the tech side, we see a Weapon System Refactor that also reinforces this. Also notably, Object Container Streaming is still the technical focus of this patch and was not modified in this update. A theme you'll see throughout this analysis is that ships, weapons, and characters are largely unchanged. One exception is that 3.3 saw the addition of a new mission giver, Clovus Darneely - likely stationed in Lorville. 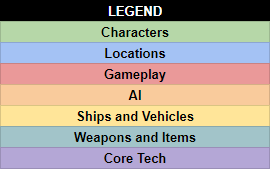 One aspect I noted with this change is the team definitely pushed some things out and made the few patches following 3.3 fairly sparse, likely because the addition of Object Container Streaming and its associated technologies will likely introduce significant technical issues to the game that need to be worked through. The major locations added in this patch are unchanged, as ArcCorp, Area18, and ArcCorp's Moons (Lyria and Wala) are still scheduled to be added. Along with this you see the technical aspect for this also still present - Procedural City Rendering Performance. The biggest changes here are that we see most of the gameplay elements, relating to the Land Claim system, moved out to 3.6. Additionally we see the next huge piece of tech after Object Container Streaming, Server Meshing, moved out to 3.6. Once again, I suspect this is for breathing room to get things sorted out with OCS before moving on to the next big technical task. Some of the preparation for Server Meshing is still in 3.4 with the Lobby Refactor and Parallel Network Jobs holding their position. 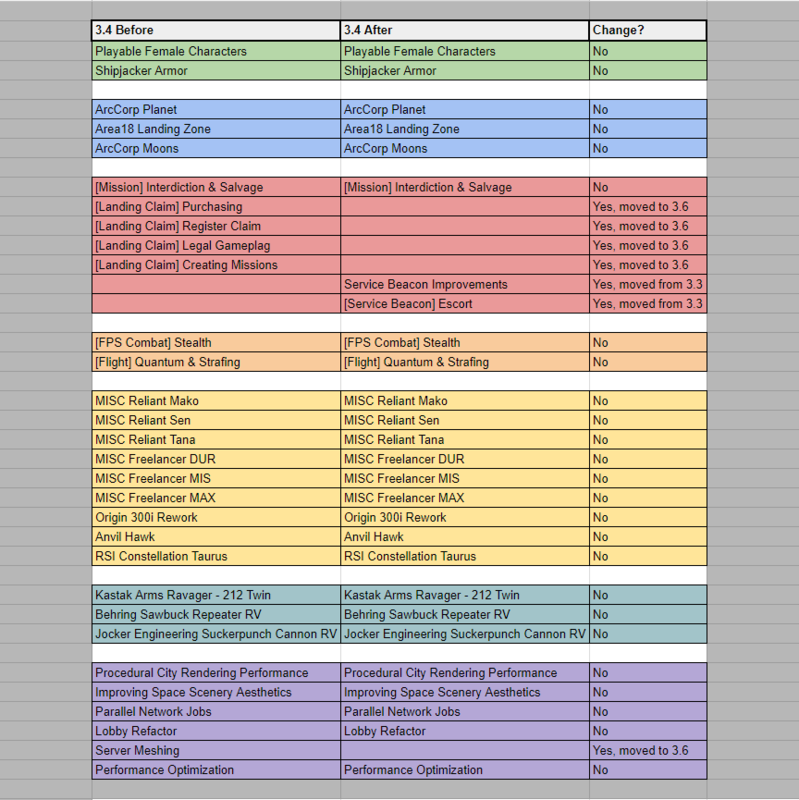 Once OCS is in place, don't be surprised if more additions crop up in 3.4 depending on how the implementation goes. 3.5 is significantly changed. More breathing room. 3.5 inherits a lot of the gameplay mechanics originally scheduled for 3.3. In turn, the gameplay mechanics scheduled for 3.5 have moved to 3.6. Notably, all locations and AI planned for this patch were also moved out to 3.6. The current setup for this patch looks like it will be filled in significantly in the future with new things that come up. 3.6 inherits some of the gameplay mechanics from 3.3, 3.4, and 3.5 as well as the AI and locations from 3.5. 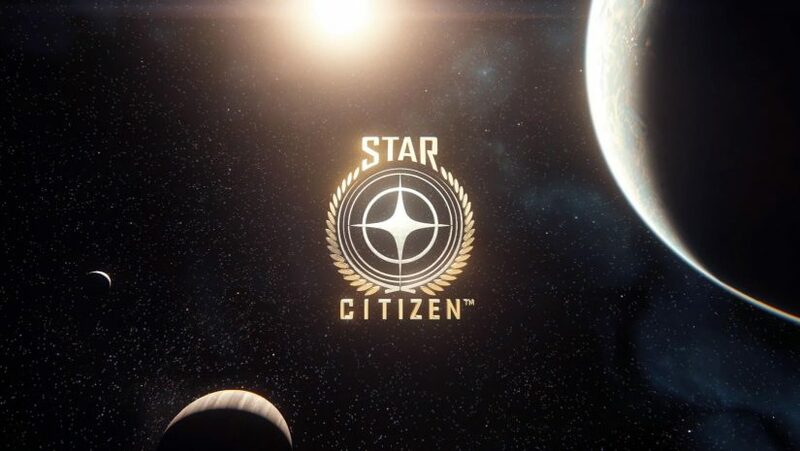 Server Meshing is a very big deal for Star Citizen as it will truly begin the transformation of the game from a multiplayer game to an MMO. Server Meshing will allow all of the players to exist inside the same universe, with servers handling areas and trading players back and forth as they moved around the universe. To be honest, this patch currently looks like a repository for all of the things not currently fitting in to 3.3 through 3.5. Don't be surprised if there are very large changes made to this patch in the future. CIG is re-aligning the schedule to fit what they're seeing. A lot of this seems to be focused on two ideas: Object Container Streaming, and the game is currently playable. Object Container Streaming and its associated technologies are big pieces of tech that are very important to Star Citizen. They will allow the universe to grow further than its current size and will, in the long term, possibly help significantly with performance. It is likely, however, that the implementation of these technologies will introduce a lot of new bugs and possibly instability in the game. It seems that CIG is clearing the decks to a minor extent to give them some time to work through that if it comes about. The huge changes to the planned gameplay additions in 3.3 seem to be recognition that there is significant value in the experiences that are currently in game and focusing on improving those experiences. The big gameplay addition here seems to be focusing on the introduction of FPS AI and FPS missions to the game, including the addition of No-Fly zones which will force players out of their ships. I'm personally also quite excited for the mining improvements and the addition of asteroid mining to 3.3. In closing, I would like to reiterate the original disclaimer though. This roadmap release was not intentional and fairly soon may see significant additional changes. Keep an eye out for that in the near future. For now, I see this as an interesting window in the thought processes currently ongoing at CIG.